Direct Press: With this process, red grape juice and skins spend a short amount of time with each other inside the press, so the resulting wine is a light pink or peach color. The longer the grape skins are left in contact with the juice, the darker the color. 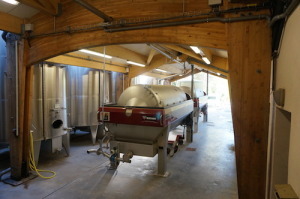 Saignée: During the creation of a red wine, a winemaker “bleeds off” some of the liquid (grape juice macerating with skins), and ferments this juice separately from the red wine. This results in the creation of two wines – a rosé and a more concentrated red wine. One of the main reasons people shy away from rosés is because they dislike sweet wine. However, they are not the sugary sweet white zinfandels of the past. Many rosés are actually quite dry, as well as light, refreshing, and easy to drink — with a red berry fruit taste and a hint of minerality. It is important to ask before buying if the wine is dry, but generally rosés made in France, Spain and Italy are dry. In Provence, the amount of residual sugar left in the wine is even mandated by law to ensure that the wines are dry. Provence, in southern France, is recognized as the birthplace of rosé, and it’s the world’s largest wine region specializing in dry rosé. And Provence rosé is gaining popularity in the U.S.: exports increased by 40% in volume and value in 2013, according to the Provence Wine Council. But rosé wine is also made in many other wine regions of the world, including: Spain, Italy, the U.S., Australia, South America and other areas of France. Can You Judge a Rosé by Its Color? Many people expect a deep colored rosé to be more flavorful than a paler one. However, the opposite is often true. Depth of color is not always correlated to flavor intensity – a pale rosé can be more nuanced and aromatic than a darker one. 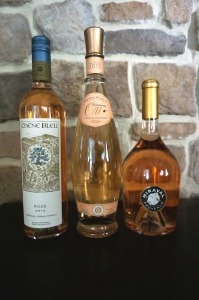 The Provence Wine Council even developed a color scale, which includes six main colors for rosé wines made in Provence: gooseberry, peach, grapefruit, cantaloupe, mango and mandarin. But you’ll commonly hear the wine described as pink or salmon. Regardless of what color you call it, the most important thing to remember is that looks are deceiving. The best way to judge a rosé is by tasting it. Domanie Ott: This is considered by many as one of the greatest rosés in the world. Its distinctive bottle shape and elegant taste make it a favorite of celebrities – who are often seen drinking it while vacationing on the French Riviera. So it’s no surprise that it’s one of the more expensive rosés on the market, especially since it’s owned by Champagne Louis Roederer, the maker of Cristal Champagne. Miraval: Brad Pitt and Angelina Jolie bought Chateau Miraval in Côtes de Provence, France and soon decided to release their own wine label – Miraval. The wine is made by the Perrin family, which owns the Château de Beaucastel estate in the Châteauneuf-du-Pape region. The Chateau has a storied history of rosé production. It once produced a wine called Pink Floyd, named after the legendary band that recorded portions of their album, The Wall, in the private recording studio on the property. Despite all this star power, the wine has received great reviews, and was in Wine Spectator’s Top 100 Wines of 2013 – the only rosé on the list. Bieler Père et Fils Coteaux d’Aix-en-Provence Rosé: made from grapes selected from five hillside vineyards surrounding the city of Aix en Provence. This rosé is a light refreshing easy drinking wine – a great value – sone Blmething you would not mind drinking every day. 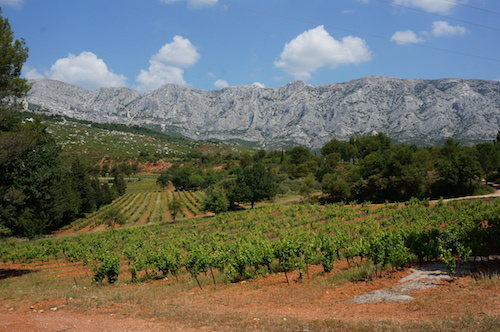 Chêne Bleu: This estate produces wines in the “Rhône tradition with a twist”. They have won numerous awards for their label (see how many bunnies you can find hidden in it). But it is their wines that truly shine – their rosé is a Syrah and Grenache blend. If you’re looking for a rosé from the U.S. Domaine Serene “R” Rosé (a proprietary blend of grapes from Oregon) and Charles & Charles Rosé (made in Washington from Syrah, Cinsault, Grenache, Counoise and Mourvedre grapes) are all good choices. Want more insights on rosés and other wines from around the world? Double Decanted offers a curated collection of bottles at a variety of price points. Let us help you find the perfect bottle – or bottles – for any occasion! To set up an appointment, please email Kelly@doubledecanted.com. Cheers!